Kinship and Closeness is a Two-Spirit program of short films that encourages viewers to redefine borders within relationships. Through genuine demonstrations of affection and care, this program hopes to promote and highlight the necessity of kinship amongst our* nations. Through storytelling, language, intimacy, ancestral teachings and gender bending, these Two-Spirit works can begin the process of decolonizing perspectives of love, gender, sexuality and partnerships while elevating Indigenous voices and facilitating methods of healing. These works encourage a queering of time through an Indigenous lens, allowing for a non-linear perception of time. Colonial boundaries between the past, present and future become unwoven. Alternatively, these short films flow through various representations of Indigenous culture while reclaiming agency our own bodies and minds through abstract moments in time. Join us for an intimate evening of featured works by Alethea Arnaquq-Baril, Beric Manywounds, Dayna Danger, Thirza Cuthand, and Adrian Stimson. Cuthand, Manywounds, and Stimson will be attendance for the screening and Q&A. A copresentation with MEDIAQUEER.CA, this screening is made possible with the generous support of the Social Sciences and Humanities Research Council of Canada and l’Université de Montréal. Approximate running time: 73 minutes. *Adrienne Huard is a Two-Spirit Anishinaabekwe currently based out of Tiohtià:ke. Her nation is Couchiching First Nations, Fort Frances, ON, and she is of Turtle clan. She recently completed her BA in art history at Concordia University and will enter the Master's program at OCAD (Toronto) in September of 2018. She is an editor in residence at Canadian Art magazine for the summer of 2018. Longboy outs himself as a First Nations FAG - who is living with HIV - hoping to sever attached preconception of two spirited peoples. In a contemplative search, the artist recollects how HIV/AIDS has affected him and his surrounding community, revealing a strength through loss. In the 1950s, two Inuit women attempt to protect their relationship when pressure from their community forces them to marry men. This short film was featured in the feature length documentary “Two Soft Thing, Two Hard Things” which was presented at the 2017 Fairy Tales Queer Film Festival. Set in the backdrop of colonial violence and the extermination of the buffalo. The Genocide of the buffalo parallels the loss of Queer Indigenous and Two-Spirit knowledge. 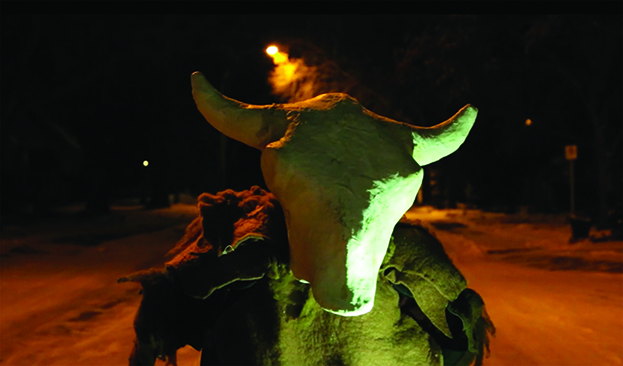 In this film a Buffalo Spirit transforms into an Nēhiyaw Iskwesis (a young Cree women), and a ghost like apparition sings Maori songs and underscores the links between colonialism on Indigenous peoples across the globe. 2Spirit/Queer, Metis/Saulteaux/Polish visual artist raised in so called Winnipeg, MB. Bebeschwendaam challenges the segregation between intimacy and kinship as a method of decolonizing Western perceptions of love and partnerships. By demonstrating candid moments between the two central figures, this playful film dismantles the notion that affection is solely reserved for romantic, heteronormative couplings. This film has been shown at Concordia’s VA Gallery in 2017 and Gallery 101 in Ottawa. Against the terrifying backdrop of a biological apocalypse, a Native teenager, Brian, comes out to his older sister, Faith, and homophobic brother, Charles. Conflict erupts among them as desperate survivors from the city seek refuge on the rez from the horrors of a “megapox” epidemic that is quickly devastating urban populations across North America. Through a perilous journey to the city for food, where they rescue Brian's "friend" in the process (an outrageous drag queen named Tonya), the hungry and frightened youth reach acceptance by facing down their fears. 2 Spirit Dreamcatcher Dot Com queers and indigenizes traditional dating site advertisements. Using a Butch NDN 'lavalife" lady (performed by director Thirza Cuthand), 2 Spirit Dreamcatcher Dot Com seduces the viewer into 2 Spirit "snagging and shacking up" with suggestions of nearby pipeline protests to take your date to, and helpful elders who will matchmake you and tell off disrespectful suitors. It's the culturally appropriate website all single 2 Spirit people wish existed. Following up on her video "2 Spirit Introductory Special $19.99" this work examines the forces of capitalism through envisioning a "financially feasible" service for a small minority community.